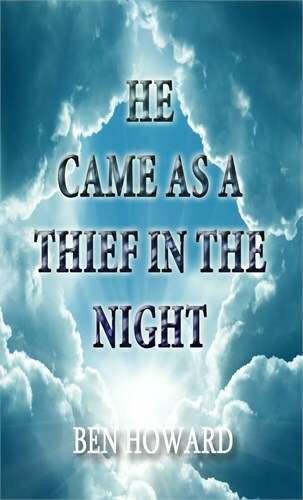 This message of He Came As A Thief In The Night was preached on February 15, 2009 in Dawsonville, Georgia, and it deals with the spiritual coming of the Lord in Revelation, Chapter 10, 1 Thessalonians, Chapters 4-5, and Matthew 25:1-11. We often hear sermons that Christ is going to come as a thief in the night, but as this event has transpired we say, "He came as a thief in the night. I preached a message once entitled, They Missed His Coming, Have We? It was about the Jews and how they missed His coming. They missed it, because He came as a little baby laying there in a manger. The parents were very poor and there was no room at the inn for Him, so Mary and Joseph rented a cow stall where there was a manger, putting cloth down on the straw where they laid the little baby. So the King of the earth was born and the whole Jewish Nation totally missed Him. Later, He went into the temple at twelve years old and the religious leaders were amazed at His wisdom; the questions He asked, and the answers He gave to their questions on the Word of God. Then He submitted Himself and went home with Mary and Joseph until He was about thirty years old. There was about eighteen years that the scriptures keep silent about and no doubt the question was asked many times, "Whatever happened to the young man that came to the temple that day with so much wisdom?" But He was soon long forgotten. So Jesus was absent as far as the scripture records for about eighteen years. Then after this, He came to the river to be baptized by John, and then His public ministry began for about three and a half years. And though He was here all the time, yet the people missed Him. Yes, the Jewish Nation as a whole totally missed His coming. So when He came into Jerusalem to offer Himself as their King, He didn't come riding in on a great white charger horse all fixed up with all the military paraphernalia on, and the people were not carrying Him on a throne blowing bugles like they would do when a king came. No. He rode in on a little donkey. Some of the common people began to pull branches off the trees to lay in the way for the little donkey to walk on saying, "Hosanna, Hosanna, to the King." The religious leaders and the Jewish Nation as a whole was ashamed of their Savior and King and rejected Him, even though they had been waiting and singing about the coming of the Messiah, and they still are waiting today. So my question is, "They missed Him, have we?" The religion of that day missed Him. That's why they said, "Let Him be crucified!" But Pilate, the Roman General, was ready to let Him live, saying, "I find no fault in this man, so let's just scourge Him and let Him go," because he wanted to do something to appease the people. But the priest and the other religious leaders cried out and got the people stirred up saying with one voice, "Crucify Him, Crucify Him!" But Pilate said, "It's customary that I release one prisoner at this time of year," so he picked the meanest man he had to compete with Jesus. He said, "Now we've got Barabbas here," who was a murderer and had none many bad things. So Pilate picked Barabbas thinking they would without a doubt choose Jesus to be released over Barabbas. He thought without a doubt they would say, "Release Jesus, and keep Barabbas behind bars." But no, they did right the opposite. They said, "Release Barabbas, release Barabbas." It didn't matter that he was a murderer and a criminal. Pilate asked, "Then what shall I do with this man called Jesus?" And in one accord they cried, "Crucify Him! Crucify Him! Let Him be crucified!" The religious world had totally missed Him. They didn't know He was the Savior of the world. They didn't know He was the one who created the world; for He was the Word. As they were crying out to crucify Him, Pilate's wife sent a note to him. She was a pagan lady, and Pilate was a pagan also. This note said, "Have nothing to do with this just man, because I have suffered many things in a dream because of Him." So that scared Pilate; he knew now he was getting into trouble. So he sent for a pan of water and washed his hands before the people. He said, "I find no fault in this man. I wash my hands; I'm free from this innocent man's blood." But you can't wash Jesus off your hands. Pilate was the only one that could authorize the crucifixion of Jesus or let Him go. But because of the persuasion of the people, Pilate delivered Him to be crucified. The same thing happens many times today where people will let other people have influence on them and persuade them to go contrary to what they know is right because something looks like it would be the most popular thing to do. But in serving God, it's usually never the popular thing to do. A lot of times it's contrary to what most people think. So the Jewish Nation missed Him. They totally missed Him. "He came as a thief in the night," as far as they were concerned He was just a little baby in a manger. Now in this last day, we find the Lord coming back again as the Mighty Angel of Revelation, Chapter 10, and the whole religious world has missed His spiritual coming.